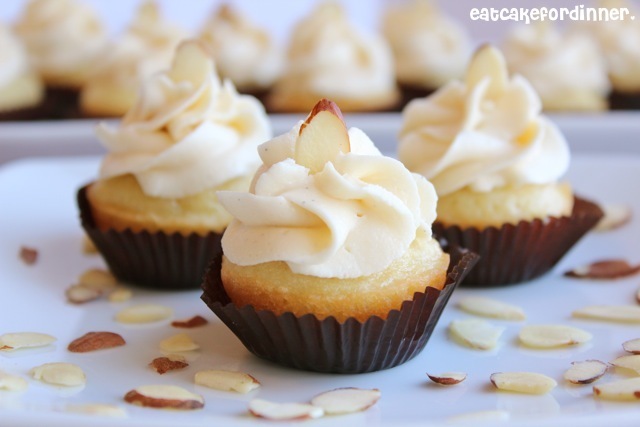 I have posted this recipe before, but as coconut cupcakes. Ever since then, I have been leaving out the coconut and using this as my go-to vanilla cupcake recipe. They are more light and fluffy than dense, but they aren't so light that they fall apart. This recipe is honestly the best I have found so far (according to my taste). The best part is that I think these taste better the 2nd day. 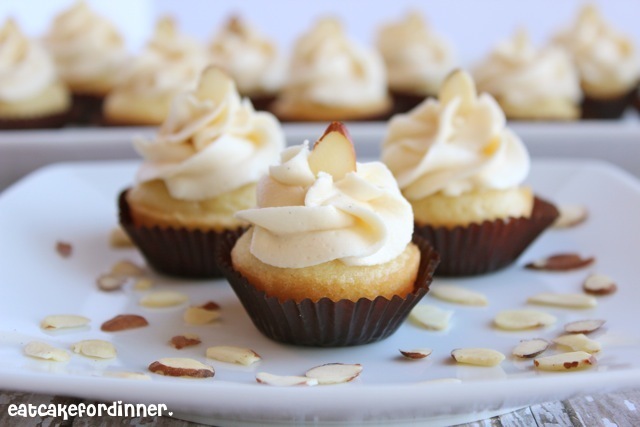 Have you ever made a vanilla cupcake that just gets better and better? I think NOT. Most cupcakes are best the first day, then they are slightly dry the next day and so on and so on, but not these. For me, that makes these stress-free, because I know I can make them the day before a party or an event and they will be AMAZING. No stress the day of. The flavor is amazing - thanks to the almond extract. 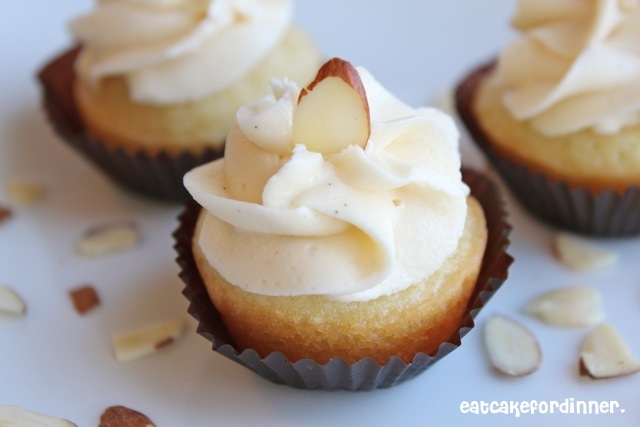 Almond extract is what makes these not just an ordinary vanilla cupcake. I recently picked up a giant 16 oz. bottle of it and I know I will have no problem using it up. I have not tried this recipe as a cake yet, only regular and mini cupcakes. When I do get around to making a cake, I will come-back and update. Preheat oven to 325 degrees. Cream butter and sugar until very light and fluffy; about 5 minutes. Add the eggs, one at a time, beating after each. Scrape down the bowl. Add the vanilla extract and almond extract and mix well. In a separate bowl, sift together the flour, baking powder, baking soda and salt. In 3 parts, alternately add the dry ingredients and buttermilk to the batter, beginning and ending with the dry. Mix until just combined. Line a muffin tin with paper liners and spray with cooking spray. Fill liners 2/3 full. For regular cupcakes: Bake 24-25 minutes and yields: 28-30 cupcakes. For mini cupcakes: Use 1 Tablespoon of batter per muffin cup, bake 10-11 minutes and yields: 100 mini cupcakes. Cool completely and top with frosting. Jenn's Notes: These taste good the first day and great the second day. After that, they slowly start to get a little more dry each day. Beat butter until fluffy. Add the salt, vanilla extract and vanilla bean paste and mix well. Gradually add the powdered sugar, one cup at a time, beating well after each. Beat for several minutes or until very light and fluffy. Add a little vanilla coffee creamer or milk, if needed, to reach desired consistency. Yields: about 3 cups. Jenn's Notes: If you want to pipe a big swirl on top of each cupcake, like I did, you might want to make 1 1/2 batches of frosting. Always looking for new cupcake recipes, you can easily adapt this recipe and add any flavor. I just found a new natural flavor brand. Silver Cloud, they have lavender which I am anxious to try. Oh, these look yummy! I like how you arranged almond slices on the icing. Very nice presentation! ps: LOVE your website banner. So very awesome! I totally should have made a heart. Great idea! These look ah-mazing!! I love a good cupcake! These are so super pretty! I love vanilla cupcakes - they are my fav! These look so yummy! You have a really nice blog. I love cupcakes for so many reasons, individual serving keeps me in check! They look so yummy! These look delicious! Can't wait to make them. Have you ever tried the frosting with vanilla extract instead of vanilla bean paste?